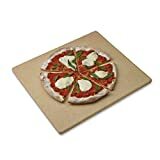 If you are a huge pizza fan and installing a pizza oven in your home sound like a total nuisance, then the best way to satisfy your craving for pizza and make delicious gourmet pizza is by getting one of the best baking stone available in the market. Yes, you heard it right, although it may seem like an unnecessary investment; it can become one of the best kitchen equipment to include into your kitchen arsenal if you are a baking addict and love baking bread or pizza. A baking stone, sometimes also referred to as a ‘Pizza stone’ is a thick flat sheet, generally made from a variety of material. The shape can be rectangular, square or round. You can find some of the best baking stone is made of steel, cast iron or ceramic. A baking stone is commonly used to bake pizza, bread, cookie in an oven. However, some baking stone is suitable to be used in a barbecue pit as well. Finding a baking stone that is in sync with your requirements is important. Here are some pros and cons of different types of baking stone material which will make it easy to choose one according to your requirements and how you intend to use it. The clay or stone material absorbs moisture as the baking takes place, which results in crisp bread or pizza. The stone can come in a variety of shape and sizes to choose from. Baking stone made of iron not only can be use to bake a pizza but also suitable for barbecue. If you are looking forward to making pizza without investing in any new equipment, you can use a cast iron skillet. Another great product in the baking industry is steel baking stone. Baking steel conducts heat in a better manner as compared to stone and it can easily cook food more evenly at a low temperature. Always preheat the baking stone before use. But it is always better to put the baking stone beforehand and let it preheat with the oven. If you are putting a cold baking stone into a hot oven and depending on the baking stone condition, there are high chances that it will break or crack due to thermal shock. If you are planning on baking a pizza, it is advised to put the stone nearer the top of the oven, however, if you are baking bread, cookies or other baked goods, you can always orient it in the middle. A baking stone is naturally nonstick. Therefore, there is no need to use oil on your dough. However, if you are using a peel, you can always sprinkle cornmeal on the bottom. You should also follow manufacturer’s tips for proper cleaning and usage of the baking stone. If you take good care of the baking stone, it will stay with you for many years to come. Before you get your hands on one, you would want to make sure that it will fit your oven perfectly. Measure the width and depth of your oven and take them along as you go to purchase the baking stone. If you have a natural gas oven, you will need to leave at least one-inch space on the side of the stone for proper circulation. Moreover, if you like the dough to be extra crisp, you can always opt for a thicker stone. Thicker stone have a better heat absorption and evenly distribute the heat to cook the food sitting on top of it. If you want your baking stone to perform optimally for many years to come, it is important to keep it clean. The materials use to make a baking stone are porous, and thus it demands proper care. And cleaning is only done after the baking stone is completely cool off. Never to clean the porous surface of the baking stone with soap. Use a clean sponge and hot water to scrub away the dough and dirt away. Do not soak the baking stone in water and let it dry completely before storing the baking stone away. Also, never let the baking stone go through a drastic temperature change as it will crack the stone due to thermal shock. There are a large number of pizza stone imitations available in the market that it becomes difficult to get your hands on the right stone. However, you need to steer clear of these fake baking stones. The imitated pizza stones are just glorified copies of real baking stones, but they do not yield the desired results. What you should look out here are the models that have been designed to move from the oven to table with ease. Moreover, you should remember that no authentic stone is ever dishwasher safe, so do not fall for the marketing gimmick which claims to be dishwasher safe. Also, choosing a thicker pizza stone is better as thinner the stone, higher are the chances of breaking or cracking over time. The only downside of a thicker baking stone that it needs longer to heat up. Lastly, it must be kept in mind that natural stone is heavy. So if you are buying it online, check whether or not the company levied shipping charges or is it included in the total cost. The Old Stone Oven Baking Stone is the standard, rectangular baking stone which is large enough to accommodate different cooking projects easily. With this baking stone, you get more surface area to work on. This baking stone can even be used on a barbecue or in a conventional oven. Other sizes of baking stone by Old Stone Oven can be found here. A cast iron pizza bake ware can be a great alternative to ceramic baking stone. The Lodge Pro-Logic cast iron pan comes loaded with several benefits that it makes it a must-have kitchen tool. Apart from baking pizza, you can even use it to cook a variety of delicious gourmet such as roasting veggies. The Lodge cast iron pizza pan is also handy to have it with you during camping or during a barbecue party. Other sizes of baking stone by Lodge can be found here. When it comes to making the perfect pizza or bread, it’s all about the uniformly browned crust. This is what Heritage ceramic pizza stone is known to offer. With the help of this pizza stone, you can easily make a pizza from starch and get consistent results. It is also easy to re-heat the pizza for a much crispier result. Whether you are picking up a ceramic baking stone, cast iron stone or a steel one, a good baking stone will make it easy for you to enjoy a great cooking experience. The baking stone featured here are some of the best baking stone brands available in the market right now. The baking stone by Lod﻿﻿ge has the highest net customer satisfaction, though. So go ahead and pick up any one of the baking stone from these brands and you will never find yourself with a burnt crust again. Also, learn how you can fully utilize your baking stone to make bread, cookies, toast or even use it as a warm serving platter. So, are you ready to bake?